Once you’ve decided to install a swimming pool in your backyard, it’s time to start the process of getting funding for your swimming pool project. Few people are able to pay for the construction of a new pool without borrowing or financing the funds for it, most people have to rely on a pool loan. Obtaining a swimming pool loan is the best and most widespread method for individuals with specific budget constraints. Using a simple procedure, they get to have the swimming pool of their dreams without significantly affecting their family budget. At AMS Financial, our aim is to present you with an easy and hassle-free solution for getting pool loans in Texas. 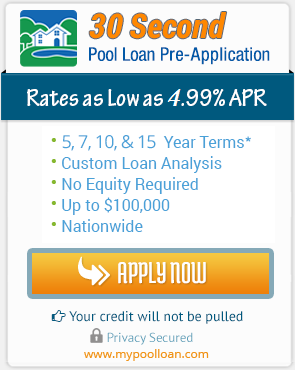 We have been America’s pool loan leader since 2004 and have successful pool loan programs even for individuals with bad credit. Our concentration is always on offering you loans that don’t require any equity. We might be among the only pool financing companies that strives to get you the best swimming pool financing in Texas with just three simple steps – upon the completion of which, you will receive the funds directly via direct deposit or check. What also separates us from our competitors are our 100% transparency of services. We offer you the widest range of loan programs to choose from for ensuring flexibility according to your demands. Each of our loan programs guarantees to have low rates, a fast and easy process, and to be secure and confidential. Obtaining the most affordable loans offered at our portal will also ensure to raise your properties’ values by an extensive margin. Apply now using our quick 30 second application to get started or contact us today to know more about our swimming pool loans services in Texas.